Today is 9 months before Christmas – the day called Annunciation here in the US’ Christian calendar. *** It’s the day when the angel Gabriel came to visit Mary to announce she was with child. In Sweden it is called Vårfrudagen (Our Lady’s Day). Vårfrudagen, if you say it fast, sounds a lot like” våffeldagen” (waffle day). So over time waffles have started being associated with this day, and March 25 has now became the official waffle day of Sweden. Just like May the Fourth and Pi-Day, it started as a play on words and took off. And you know me, I am all for word play celebrations!!! Now, to make our DEATH STAR WAFFLES extra special and particularly awesome, we decided to make them proper Death Star grey. Once cooked however, they still looked a bit golden, but we got close. We also tried Bantha Milk blue, which was pretty awesome as well (though they turned out more turquoise than blue). Now, before I get into the How-to’s, I want to wish you all a Blessed Easter! In the busy-ness of life, we sometimes forget to enjoy our blessings. This weekend is the perfect chance to reflect and be grateful for what we have, and share the love we have been given by our family, friends and by God. Just follow the recipe on the mix box. hm… I supposed you can also make them from scratch. Add food coloring. You’ll need quite a bit. I used 12 drops of blue and 3 red. 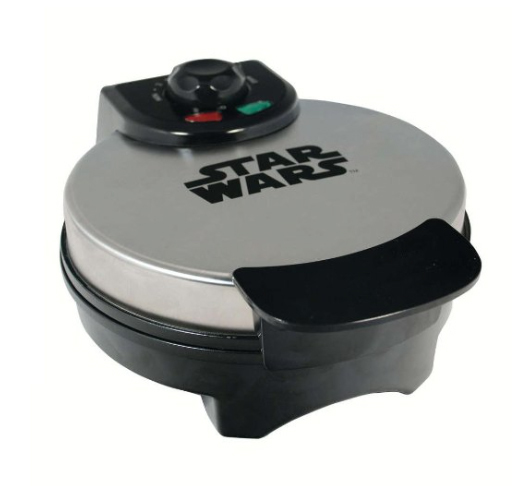 Make sure you spray the DEATH STAR WAFFLE MAKER with cooking spray in-between making each waffle. The instructions for the DEATH STAR WAFFLE MAKER calls for 1 cup of batter per waffle, but that is way too much, ¾ cup was perfect. The DEATH STAR WAFFLES turned out a better when I held the lid down. But be really, really, really, careful if you try that, since the DEATH STAR WAFFLE MAKER emits steam that can easily burn you. I recommend using an oven-mit if you are going to try that. 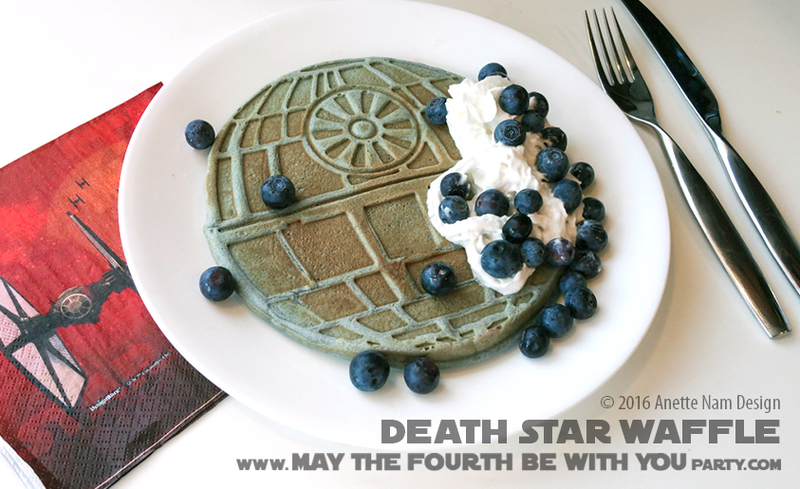 The hubby and the kids preferred their DEATH STAR WAFFLES with whipped cream and blueberries. Me, I’m a purist. Maple syrup for me. *** This year (2016), in the US, the Annunciation actually falls on April 4th instead of March 25th, since by tradition, it cannot be celebrated on Holy Week (Easter week). However, in Sweden, Waffle Day remains the same day as always. Oooo I love it! I have a Darth Vader toaster which I love, but I definitely wouldn’t mind some Death Star waffles! I rarely use my waffle machine, but this would probably get me using it. So there are these Jello Star Wars molds out – have you seen them? You should pick them up. I just made some a few days ago and meant to post a pic on Instagram, but then ate them and forgot lol. I just looked at the Jell-o Molds! I’ll definitely have to try them out. My husband got me a Death Star waffle maker as a present, too!! It worked even better than I was expecting. I’d never heard of the connection between Annunciation and waffles in Sweden, that’s so cool! Seems like you have a keeper of a husband too :-). And yes, I was not expecting it be as wonderfully splendid as it is. Lots of times these gadgets are cooler in concepts than execution, but the DEATH STAR WAFFLE MAKER is a total must-have. I think we might even have a DEATH STAR WAFFLE STATION at our next May the Fourth Party.